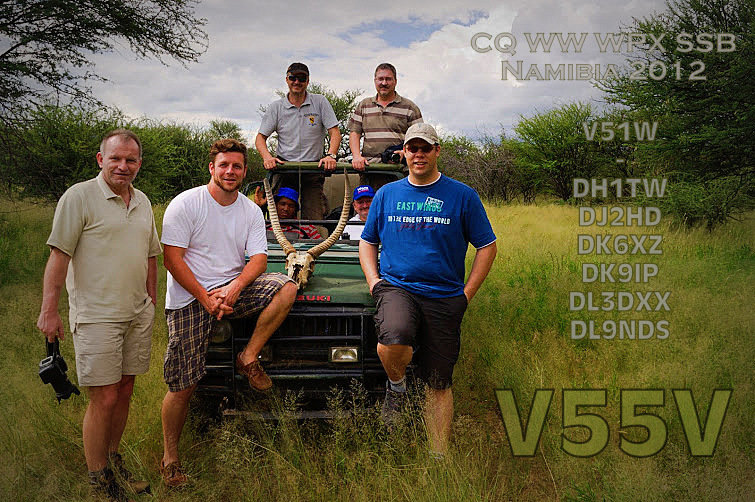 DK9IP will be active from Namibia CQ WW DX CW Contest 29 - 30 November 2014 as V55V. 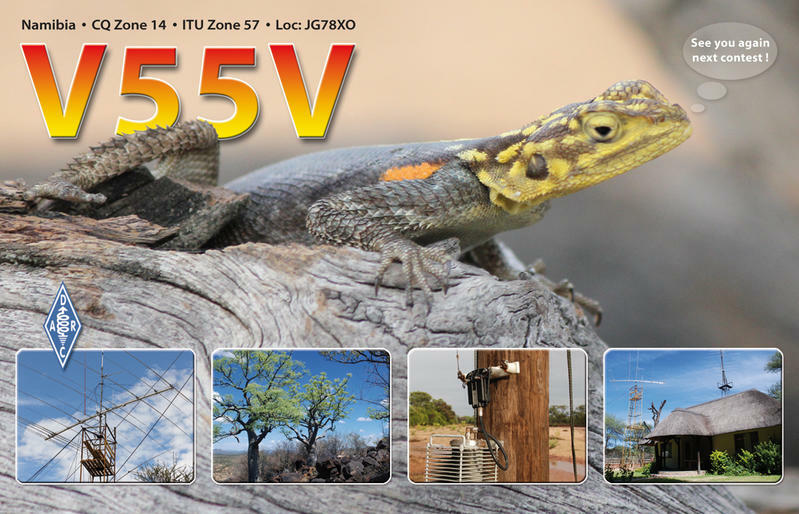 Before and after contest he will opeate on 160-6m as V5/DK9IP. Formerly South West Africa, Namibia is a country in southern Africa with the Atlantic Ocean as its western border. It is located between 17 and 29 degrees south of the Equator and is neighbors to Botswana to the east, Angola and Zambia to the north, and South Africa to the south and east. On 21 March 1990, Namibia, following the Namibian War of Independence, gained its independence from South Africa. Windhoek is Namibia’s capital and largest city while the country itself sits on approximately 824 292 km2 of land. From south to north, Namibia stretches for approximately 1300km and varies from 480-930km on the West to East width stretch. It is home to the oldest desert in the world, the Namib Desert. Namibia is the 34th largest country in the world with its surface area of 824,292 km2 . Owing to its location between the Namib and the Kalahari deserts, Namibia has the least rainfall in sub-Saharan Africa. The country comprises of five geographical areas: the Central Plateau, Great Escarpment, Namib Desert, Kalahari Desert and Bushveld. Generally speaking the Central plateau which runs from north to south is a wide and flat area that is home to a large percentage of the country’s population. Stretching along the entire coastline of Namibia, the Namib Desert boasts of some of the highest sand dunes in the world in addition to some of the world’s oldest deserts. The Kalahari Desert on the other hand boasts of over 5,000 species of plants irrespective of the fact that it is sandy and hyper-arid. The great Escarpment which swiftly rises to over 6,562 ft is rocky in nature. It is also considerably developed. The Bushveld region on the other hand is a majorly sandy and flat piece of land that is located long the Angolan border in northeastern Namibia. The country is further demarcated into the 14 regions of: Kavango East, the Zambezi, Kunene, Kavango West, Oshana, Oshikoto and Ohangwena in the north, Otjozondjupa, the Omaheke, Khomas and Erongo regions in the Central areas and the !Karas and the Hardap regions in the south. The country’s highest point is Brandenburg (Konigstein) that stands at approximately 8,550 feet while its lowest point is the Atlantic Ocean that stands at 0m. The most significant river to the counter is the Fish River which has a tendency of completely drying out in the winter season hence making its flow a seasonal one. It stretches for approximately 403 miles. Generally Namibia’s climate is very dry and pleasant, with plenty of sunshine throughout the year. Generally dry months fall in the winter season between the months of June and August. The months between September and November tend to be the summer months that also hold the country’s rainy seasons. On average, the country sees rainfall of about 350mm annually. As such, water dependency tends to be largely on ground water. Caprivi that is located in the northeast part of the country receives the highest rainfall to the region, which rainfall tends to decrease in a westerly and southwesterly route. Different cultures grace the country of Namibia thanks to the numerous cultures that were present during colonization. Culturally, the population of Namibia is broken down into the Herero and Ovambo who are bantu speaking people, the colored people(people with mixed blood), the Damara, Khoisan, and Caucasians(mainly ethnic Germans and Afrikaners). Some of the country’s smaller groups of peoples – such as the Bushmen (San) that are found in the east and the Himba that are found in the north – still carry on to their ancient nomadic or semi-nomadic way of life. There is a strong German cultural influence to the region majorly thanks to the redolent of 19th century Germany. Much of the country comprises of a sparse population, with approximately 2.1 people per square kilometer. A vast majority of the population belongs to the Bantu speaking peoples such as the Ovambo and Herero. There are different religions being practiced in Namibia. Majority of the people of Namibia come from the Christian community (80-90%) while t least 50% of them are Lutheran. The rest of the population (10-20%) holds indigenous beliefs. Aside from the Lutherans and indigenous believing people, Methodists, Roman Catholics, African Methodist Episcopal, Anglican, Mormons, Rhenish Christians and the Dutch Reformed can also be found in the country. Much as there are numerous languages spoken in the country, English has been Namibia’s official language since 1991, although up until its inception, Afrikaans and German were also official languages. To date, there are still tresses of the German rule in terms of language even after their colonization period ended. Oshiwambo is spoken by most Namibians as a first language while Afrikaans is the most widely understood and spoken language in the Nation. Aside from the more common languages of English, Afrikaans and Oshiwambo, other small languages are also present including; Otjiherero(9%), Nama/Damara(11.3%) and Kavango(9%). Namibia is home to a fossil plant, the Welwitschia Mirabilis, which is capable of reaching 2,000 years. This plant can be found in the Namib Desert. Namibia’s Constitution is the first one to include a provision for environmental protection. Roughly 14% of Namibia’s land area is protected zone. Every last Sunday of August, members of the Herero community of Namibia gather to pay respect to those who lost their lives during colonial times. In 1838, the Gibeon meteorite shower, the largest meteorite shower ever, was discovered in Namibia. The Arnhem Cave is the longest cave system in Namibia. Once upon a time, the Tsumeb Mine was the richest source of zinc and led in Africa. Namibia is home to the world’s largest underground lake, Dragon’s Breath, which is located in Hariseb. Namibia is home to the largest free-roaming cheetah population in the world. On average, they are estimated to be approximately 2,500. Namibia as a country is also home to the world’s oldest desert known as the Namib Desert.